Insurance works when individual contributions make up a large enough pool to protect participants in times of need. 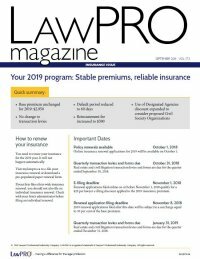 After many years of collecting data, LAWPRO has a wealth of knowledge about what makes a lawyer’s practice more or less risky. The following categories will help you understand the coverage, limits, premiums and deductibles of your insurance.